NEW YORK–(BUSINESS WIRE)–2K today announced in-game soundtrack details for WWE® 2K19, the forthcoming release in the flagship WWE video game franchise. 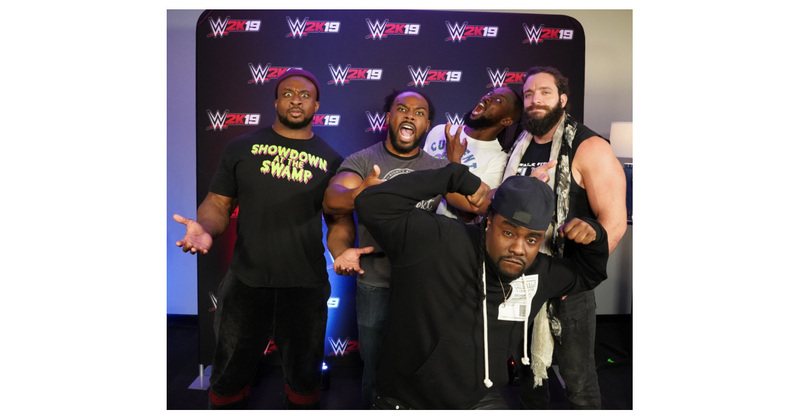 The soundtrack was exclusively revealed yesterday by WWE Superstars The New Day® and Elias™ – along with global hip-hop magnate and WWE superfan Wale on UpUpDownDown™, WWE Superstar Xavier Woods®’ preeminent gaming YouTube channel. Executive produced and personally curated by several WWE Superstars as a special gift to the WWE Universe, WWE 2K19’s soundtrack features 12 unique songs across hip-hop, hard rock, heavy metal and alternative/indie rock that represent many of the Superstars’ favorites when preparing for a match, on the road, in the gym or relaxing at home. In addition, Apple Music will serve as the premier streaming provider for the WWE 2K19 in-game soundtrack, with the collection of hand-picked Superstar hits available now for streaming at apple.co/wwe2k19. Developed collaboratively by Yuke’s and Visual Concepts, a 2K studio, WWE 2K19 is rated “T” for Teen by the ESRB. WWE 2K19 is currently scheduled for worldwide release on October 9, 2018 for the PlayStation®4 computer entertainment system, Xbox One family of devices including the Xbox One X and Windows PC. Players who purchase the WWE 2K19 Wooooo! Edition at participating retailers will receive Early Access to their game copies and in-game bonuses beginning four days early on October 5, 2018 for the PS4™ system and Xbox One. In addition, players who purchase the WWE 2K19 Deluxe Edition, available in both physical and digital varieties at participating retailers, will also receive Early Access to their game copies and in-game bonuses – including all Wooooo! Edition digital content – beginning four days early on October 5, 2018 for the PS4™ system, Xbox One and Windows PC. For more information on WWE 2K19 and 2K, visit wwe.2k.com, become a fan on Facebook, follow the game on Twitter and Instagram using the hashtags #WWE2K19 and #NeverSayNever or subscribe on YouTube. For more information on the WWE 2K19 Million Dollar Challenge, please visit wwe.2k.com/milliondollarchallenge/rules. The statements contained herein which are not historical facts are considered forward-looking statements under federal securities laws and may be identified by words such as “anticipates,” “believes,” “estimates,” “expects,” “intends,” “plans,” “potential,” “predicts,” “projects,” “seeks,” “should,” “will,” or words of similar meaning and include, but are not limited to, statements regarding the outlook for the Company's future business and financial performance. Such forward-looking statements are based on the current beliefs of our management as well as assumptions made by and information currently available to them, which are subject to inherent uncertainties, risks and changes in circumstances that are difficult to predict. Actual outcomes and results may vary materially from these forward-looking statements based on a variety of risks and uncertainties including: our dependence on key management and product development personnel, our dependence on our Grand Theft Auto products and our ability to develop other hit titles, the timely release and significant market acceptance of our games, the ability to maintain acceptable pricing levels on our games, and risks associated with international operations. Other important factors and information are contained in the Company's most recent Annual Report on Form 10-K, including the risks summarized in the section entitled “Risk Factors,” the Company’s most recent Quarterly Report on Form 10-Q, and the Company's other periodic filings with the SEC, which can be accessed at http://www.take2games.com/. All forward-looking statements are qualified by these cautionary statements and apply only as of the date they are made. The Company undertakes no obligation to update any forward-looking statement, whether as a result of new information, future events or otherwise.